Wade Miley was sent to the Baltimore Orioles Sunday for Cuban refugee Ariel Miranda, 27, who spent most of the season at AAA. He will report to Tacoma. The Mariners acquired a 27-year-old LHP and defector from Cuba, Ariel Miranda, Sunday via the Baltimore Orioles for LHP Wade Miley, who pitched the best game of his season Saturday in a 4-1 win over the Cubs in Chicago. Miranda, 6-foot-2 and 190 pounds, played seven seasons in Cuba before signing as a free agent with Baltimore May 27, 2015, but has only two games of major league experience. He was 4-7 with a 3.93 ERA in 19 starts with AAA Norfolk this season with 87 strikeouts and 31 walks. He will report to AAA Tacoma. Over his past seven starts, Miranda is 3-0 with a 1.93 ERA (9 ER, 42.0 IP) with 33 strikeouts and 11 walks. Earlier this season, July 3 at Seattle, Miranda made his major league debut, allowing three runs on four hits with four strikeouts in two innings. In 2015, Miranda was 6-3 with a 3.60 ERA with 71 strikeouts and 26 walks in 14 combined starts with three Orioles farm teams. 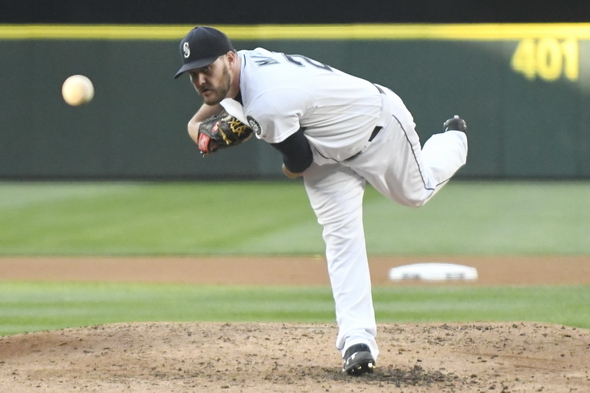 Miley, 29, is 7-8 with a 4.98 ERA in 19 starts with the Mariners this season. Saturday at Wrigley, he had a no-hitter for six innings, then allowed one hit and one run in the seventh, but gained his first win after six consecutive losses. He began the season 6-2, 5.27 (71.2 IP, 42 ER) in his first 12 starts. He went on the 15-day disabled list in May with a sore shoulder. Miley has a career mark of 56-54 with a 4.07 ERA (427 ER, 944.1 IP) in 157 career appearances (153 starts) with Arizona, Boston and Seattle. Seattle acquired Miley Dec. 7 with RHP Jonathan Aro) from the Boston Red Sox in exchange for RHP Carson Smith and LHP Roenis Elias. “It is a bittersweet ending to the trade we made last winter with high hopes,” Dipoto said. “We are appreciative of everything that Wade did for the Mariners organization, culminating with his best performance of the season yesterday against the Chicago Cubs, one of the best teams in the league. Guess they like LeBlanc. Can’t understand this trade.